first of all, happy friday everyone. you have no idea how happy i am, this week seemed endless with so much stuff to do. one other thing about friday, i don't know exactly why, seems like the perfect day to play some morrisssey - hence the title. unfortunately all this running around has been kinda counterproductive blog wise. i barely had time to update and here we are, it's friday and this is my only outfit post of the week. although i still had some errands to run i decided to take a break today, dress up, have a nice lunch with the girls and then come back after work and only indulge in pleasant activities like updating the blog, catching up with what has been going on in the blogosphere and watching my favorite shows. dressing up today involved a little black dress with wonderful pockets in the front, hypnotic striped tights, ankle boots and my new favorite cardigan. 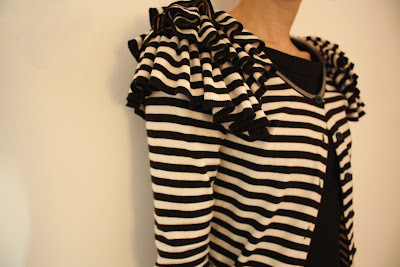 i am crazy about the ruffled shoulders. i know i will be doing a lot of black and white outfits again this fall, hope you won't get bored with them. i just love the visual impact of black and white. ok now, time to finish this and get back to the latest episode of project runway. i am rooting for mondo this season. who's your favorite? I LOVE Mondo...every since the first couple of episodes with him feeling sad that he didn't fit in, my heart has been his lol. I feel ya on not having time to update the blog lately, must be going around! Love your outfit and love you girlfriend! oh I love love love this daring outfit !! !